We’re back! I know it’s been months since the last post — 2014 was a big year. I got married and got a new job! Both really exciting things but with all the ensuing happy craziness, it left little to no time for blog posts (or much gardening, to be honest). Last year our garden did OK — not great, but not too terrible. Part of it is because of the aforementioned life events, part of it because of the cooler summer weather, part of it because of the constant plague of garden pests and creatures we have, but it’s mostly because we weren’t keeping up with it. It also probably didn’t help when the garden was more or less ignored for more than a week while we were on our honeymoon. This season we’re practically starting over — new raised bed boxes, new soil and new method. We’re trying more of the square foot gardening method to get as much out of our efforts as possible. We’ve also built new boxes and filled most of them with Mel’s Mix, the “perfect garden soil” formula from the books. We know not everything is going to be perfect. For starters, we added Mel’s Mix on top of the soil and whatever else is there: leaves left over from the fall, a bunch of plants I forgot to pull out (do carrots overwinter? ), and likely a handful of those little veggie and herb tags that have been unwittingly mixed in over the years. 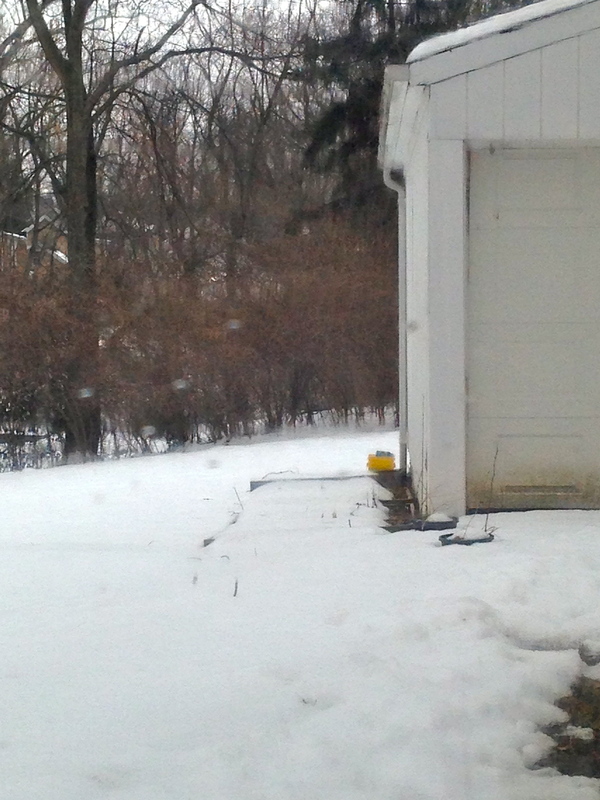 Snow in early March delayed our garden plans. Second, we’re getting a later start on spring planting. Again. This is out of our control — it doesn’t help (or motivate you) when in early March everything is still covered in snow and is then followed by days upon days of rain. This past weekend was our first nice one (sunshine! warmer temperatures!) in a long time. Finally, we know our garden won’t be perfect because, let’s face it, life has an odd sense of humor. This weekend is a perfect example. After spending a few hours at several different stores gathering wood for the new beds and the ingredients for our soil mixture, we grabbed the wheelbarrow so we didn’t have to lug 40-pound bags of compost to the back yard. And guess what? Our wheelbarrow, which we rarely use, had a flat tire. Luckily our neighbor, who is an avid and awesome gardener herself, let us borrow hers. Oh, and to top it off, the drill ran out of batteries when we had our last three screws to put in the last of four raised bed boxes. This year we’ll post more (I promise!) as we go through our gardening adventure, sharing ideas and experiments from last season, as well as all the successes and failures we have (hoping it’s more of the former this time). In the meantime, here’s our rough planting plan for this year. I’m sure we’ll move things around when they actually get planted. The garlic is in a different place in both beds because, as usual, I forget where I planted them until the shoots start poking through the ground. And also, I got a little overzealous when buying our broccoli — we have 18 plants now, and I’ll probably experiment some more with container growing. Here it is, our grand garden plan. It’s ambitious, but I’m optimistic about it. 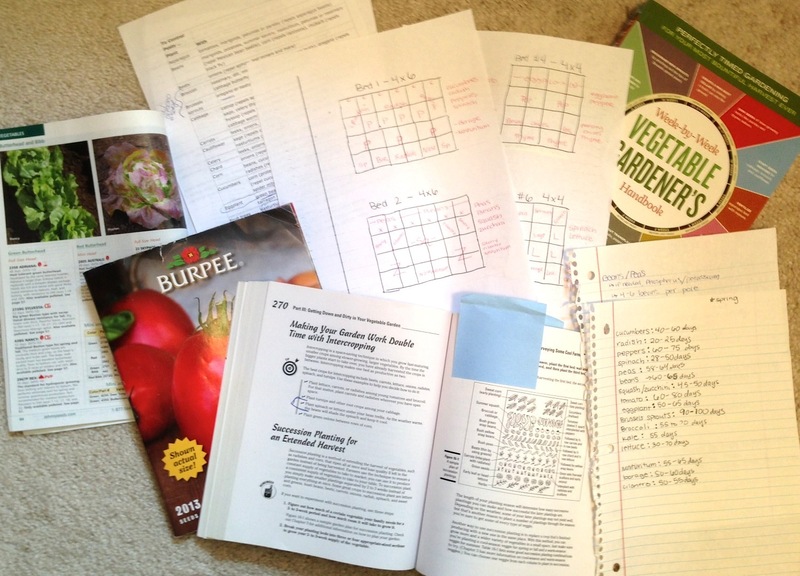 We’re trying something new this year, both with vegetables and planning. Last year everything worked fairly well, and we stuck to the plan — for the most part. This year, we’re adding carrots, which is something we’ve never tried before. And we’re going to try again with Brussels sprouts, broccoli and kale because none worked particularly well. The broccoli bolted pretty early, the Brussels sprouts never really grew and the kale was knocked over and destroyed by squirrels. We’re also going to try to follow the square-foot gardening method a little more closely. We sort of tried it last year, but not exactly. 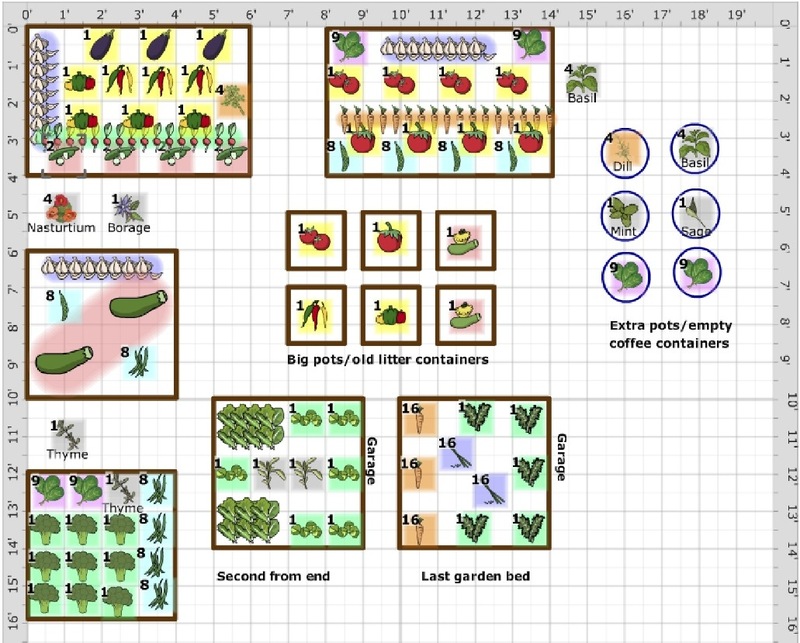 Our garden plan for this year. It’s a mix of square-foot gardening and succession planting, plus some container plants. I’ve also splurged ($25 for a year) on the garden planner tool from Mother Earth News. In the little bit I’ve played around with it, the tools are really great, and it’s what I used to create the picture above. Some are harder to see, so I’ll explain what’s in each bed. It looks very crowded because I have “all months” showing, but there is some succession planting going on here — the peas will be gone before the tomatoes need the room; the garlic will be pulled before the zucchini needs room to spread, etc. We’re also going to use our “alternative pots,” which are basically old coffee containers and big buckets that used to contain cat litter. Everything will be washed and have holes drilled in the bottom for drainage. It’s hard to think about gardening when temperatures are near zero with negative wind chills. We’re in Ohio and just got past the cold spell brought on by the “polar vortex.” But, that being said, we’re still thinking about the garden. There are two things I’m hoping happen with this deep freeze. 1. It kills any eggs/larva of the insects that destroyed many of our plants: squash vine borer, leaf hoppers, squash bugs and cucumber beetles. Especially the last one because those were awful this year. 2. Our garlic survives. We bought some on a whim and planted them a little later than we should have. I really hope they had time to set some roots before it got too cold. We have another goal this year: to post more often. I have quite a few recipes, stories, plans for next year and other things to share from the past season. Finally, I’ve noticed a lot of views coming from Australia and New Zealand recently, which makes sense because of the opposite seasons. So I’d like to say welcome! I hope you enjoy what you find here, and it helps your garden in some way!